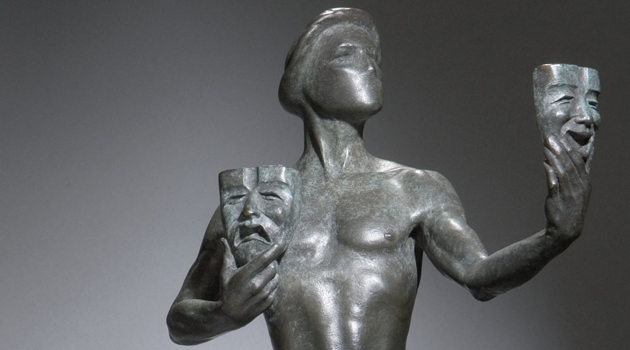 Trying to predict the Screen Actors Guild award nominations is a lot like the photo of the group’s statue above; the comic smiling face and the sad face of tragedy. SAG is such a crazy and unique animal in the awards predicting race that it sometimes makes you feel bi-polar trying to suss it out. The nomination voting process for the Screen Actors Guild is a randomly selected group of 2200 active members (you can only be chosen every eight years) from what is now an enormous group of over 160,000 people since the SAG-AFTRA merge. Those 2200 don’t necessarily live in Los Angeles or New York City. They can live in Peoria, Sacramento or Bowling Green. That means, all of those fun and cool SAG screenings and Q&As in the big cities with the big stars do nothing for those voters. Those voters need screeners, pure and simple. Crash taught us back in 2004 the importance of getting the movie in front of voters’ eyes. Yeah, there are sometimes some ‘blind’ votes that come in but it’s not that common. Look at the absolute craziness of last year’s nominations: Beasts of No Nation, Straight Outta Compton, Trumbo, Sarah Silverman. These were strong screener presences and the impact was felt on nomination morning. Another element that is vital to remember is that since the merge, it’s no longer just actors voting on these. AFTRA brought in “160,000 actors, announcers, broadcaster journalists, dancers, DJs, news writers, news editors, program hosts, puppeteers, recording artists, singers, stunt performers, voiceover artists and other professionals” into the mix. The last thing to consider are a few statistics. The SAG Awards are only 22 years old, young in terms of awards season. But for the last seven years, SAG’s Outstanding Performance by a Cast in a Motion Picture has had at least one film that was theatrically released by August (before the start of awards season). Meaning, a film that was already in theaters/out of theaters by the time awards season rolled in is getting into the top category. The nominations will be announced live on Wednesay, December 14th at the Pacific Design Center in West Hollywood by Sophia Bush and Common. The nominations announcement will be carried live on TNT TBS, truTV, sagawards.tntdrama.com and truTV.com at 10 a.m. (ET) / 7 a.m. (PT). SAG-AFTRA President Gabrielle Carteris will introduce Bush and Common. Prior to the announcement, this year’s stunt ensemble honors nominees will be announced during a live webcast on sagawards.tntdrama.com 9:50 a.m. (ET) / 6:50 a.m. (PT). Hell or High Water, which is now pretty clearly a top 5 awards contender is going to fit the bill of that previously mentioned stat about early releases. While there are a few others that could, HOHW is far and away the favorite. Manchester by the Sea and Moonlight should be very comfortable here. La La Land, the Best Picture Oscar frontrunner, should be able to land here despite its very small credited cast (which should be only five people). But, films have been nominated (and won) here with five or less before. That said, no film has won the Best Picture Oscar without being nominated here first except for Braveheart. That was the first year of this category (back in 1995) and the second year of the awards. Hidden Figures is the mystery for me. It’s picked up a few Ensemble critics wins and seems likely. But its very late release means the screeners sent out need to be watched. Thankfully, 20th Century Fox did get them out in time for voting and it’s definitely a film that could be watched by voters and their families over the Thanksgiving holiday weekend, which is so often when voters see these films before deciding. There is also the history of this award that finds a nominee being the single mention it gets. Lone Cast in a Motion Picture mentions have happened 15 times since the inception of these awards, sometimes even winning. That said, I won’t be shocked to see early release Eye in the Sky here or Fences, based on Denzel Washington and Viola Davis being able to secure spots in their individual categories. I’m also leaning to Lion taking a spot here after its strong performance at the Globes. When Tom Hanks missed out on a Golden Globe nomination, keeping him in here gave me pause. But, I feel the voters in the nom comm will handily get him in. It’s early release and box office success should ensure that. Viggo Mortensen feels like such a SAG pick but will it be at the expense of Joel Edgerton and Andrew Garfield? Much has been made of Amy Adams’s pair of recent snubs with SAG (American Hustle and The Master) but Arrival came out in early November and it’s a hit; it’s one of the very few films in awards contention that is. Isabelle Huppert, who has swept the critics’ awards, doesn’t seem likely here but her run could continue and I wouldn’t be surprised one bit. Like, Edgerton in Male Actor, Ruth Negga is probably just barely on the outside looking in but she could still make it. I would say Adams and Bening are probably the most vulnerable for on the ‘Other Contenders’ to break in. Plus, always gotta remember Sarah Silverman. With Hugh Grant competing in this category it’s very unlikely we’ll see Simon Helberg show up like he did at the Golden Globes. I desperately want to pick Ben Foster to join his co-star Jeff Bridges here and it’s certainly possible. SAG is not afraid to put up two supporting actors from the same film – it happened with No Country for Old Men, Crash, and The Contender. In all of those instances, however, only one got the Oscar nomination. Interestingly enough, with The Contender it was Jeff Bridges who got into Oscar over his SAG co-nominee (Gary Oldman). Although Lucas Hedges missed out on a Globe nomination, SAG is much more open to nominating young actors. Plus, he comes from a movie industry family so he should be safe here. For a little while, I had Alan Rickman in for a posthumous nomination but this doesn’t feel quite like when James Gandolfini pulled that off. There just isn’t a groundswell to make it happen. Plus, Gandolfini had the support of television voters behind him and was a previous SAG winner. Don’t be surprised if Aaron Eckhart is able to coattail in on Tom Hanks either. This could, and should, be where Eye in the Sky makes its mark. Never, ever underestimate the power of Helen Mirren. She is the Queen of SAG and Bleecker Street has pushed her film hard. Her three nominations last year are nothing to take likely. That makes room for very little other than the expected Oscar nominees and current Golden Globe contenders. But, if Hidden Figures makes it in the top spot, we could see Octavia Spencer or Janelle Monáe break through. This feels open and I honestly don’t know who is getting in. This seems like the batch of most likely to.